The Center welcomes everyone to its collective studies, meditations, aesthetic events, public discourses, and weekend retreats. We are both a study and a practice center, so guidance and conferring about the practice of yoga are available by appointment without charge. 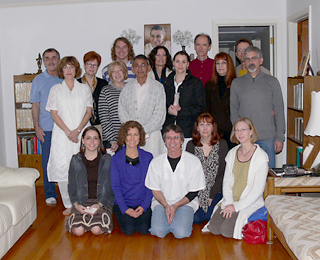 The Center holds a collective study, satsang, every Sunday evening at 7, focusing on the practice of the Integral Yoga. The prelude to our meeting is the Mother’s music and Sanskrit chants, succeeded by a presentation of the salient features of the evening’s material, with questions and answers at the end. The evening is capped with collective meditation. We’ve worked recently in Sri Aurobindo’s The Life Divine, The Synthesis of Yoga, Essays on the Gita, and The Mother. We focused too on the Mother’s Conversations, Notes on the Way, and a few volumes in her Questions and Answers series. To prepare for a long study of Sri Aurobindo’s The Life Divine — commencing on August 2014 — we devoted our Sunday evenings in the spring and summer of 2014 to a review of India’s spiritual tradition from the Vedic age to the present. Along the way, we examined core insights from the Rigveda, Upanishads, Bhagavad Gita, Buddhism, Jainism, the Yoga Sutras, the major schools of Vedanta, the Mahadevi tradition, Tantra, Sri Vidya, the Trika philosophy of Kashmir, and the bhakti tradition. We offer two daily sessions in the Center’s Shrine Room with Sri Aurobindo’s Relics, the first from 7 to 7.30 in the morning. the second from 5.30 to 6 in the evening. At the close of the evening meditation, we read aloud two pages from Sri Aurobindo’s great epic, Savitri. The Center’s tradition is to read the first pages of the poem on the 15th of August, and to end with the closing lines on the following 14th of August. Thus we cycle through every annum with Savitri. Each New Year’s Eve we gather for a common meditation which begins about half an hour before midnight. When the New Year arrives, we distribute calendars and prasad and the Ashram message. Everyone is welcome to join us. The Center occasionally screens significant films dealing with the growth of consciousness. Again, the public is welcome to attend all events without charge.